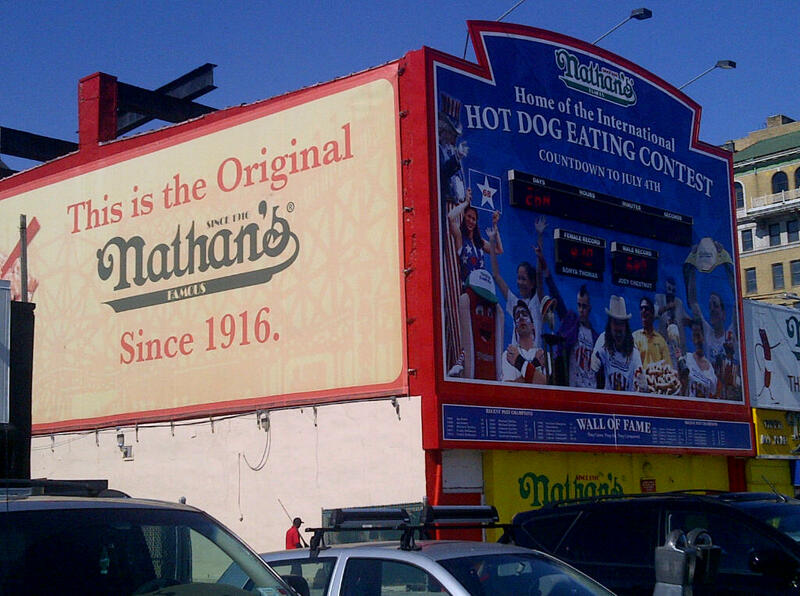 Approaching the front of Nathan's yay! We arrived a little before noon and there was already a crowd. The wait was excruciatingly slow, but it only added to the excitement (so I like to explain to myself)! By the time we got to the front of the line, our commitment to NOT over-order this time was out the window and we walked away with: one corn dog, one chili cheese dog with onions and peppers, medium order of chili cheese fries, a seafood platter with battered fish, clam strips, shrimp, and fries (as the bf says…when he’s by the sea there’s always a hankering for seafood! ), and a large old-fashioned lemonade to share. 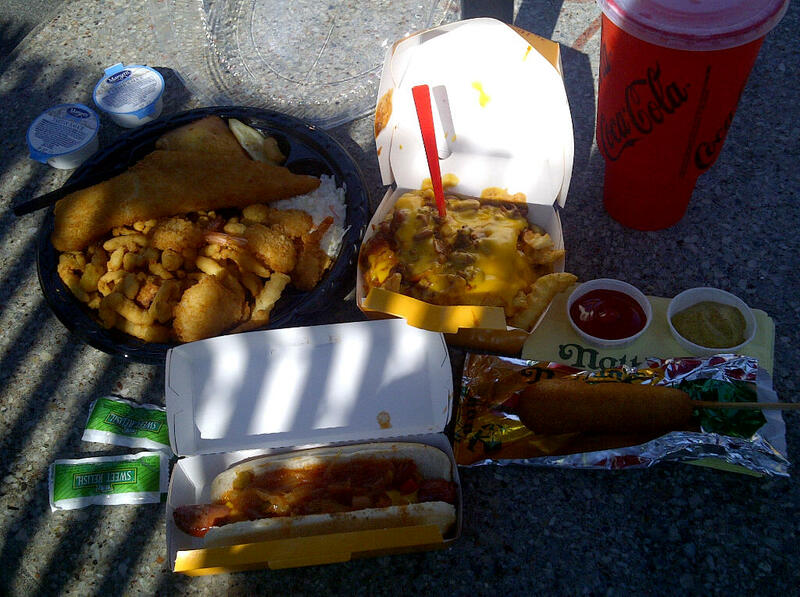 Light lunch anyone? Right around the corner on the side of the building is an outdoor seating area for all to enjoy their feast. Now, I’m no hot dog connoisseur (actually, I don’t usually eat hot dogs) but I have to admit Nathan’s corn dogs are delicious! 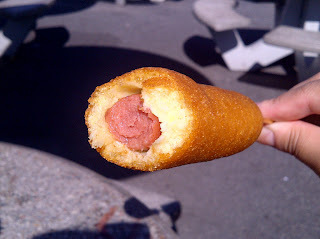 They were fresh out of the fryer and crispy on the outside while soft and tasty on the inside. The bf enjoyed his hot dog so much that he decided that he was going to start eating at the Nathan’s around the corner from my apartment more often (but I didn’t have the heart to remind him that it closed down recently ha). The chili fries were flavorful, but you had to eat it fast otherwise the fries would turn mushy if left sitting in the cheese and chili too long (I like my fries crispy, but to those who enjoy soggy fries you may enjoy letting the chili seep into the fries). The big surprise of the afternoon was definitely the seafood platter. I’ll be honest, I had my reservations about ordering seafood from a hot dog joint (fried or not) but it was actually tasty! Ok – lets not interpret my previous statement to mean that this was life changing and Nathan’s should abandon the hot dog in favor of seafood. This is definitely not the case, but everything on that platter was freshly fried, still hot and crispy. While the clam strips tasted more like fried pieces of flour, the shrimp and battered fish were appetizing and I enjoyed trying something new. 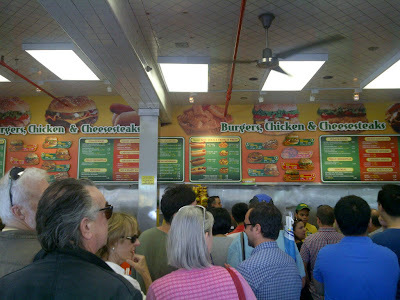 All in all, I had an enjoyable experience eating at the original Nathan’s. I’m not sure if it’s any different from other Nathan’s locations but I can vouch for the freshness of the Coney Island Nathan’s (no hot dog sitting out under a heat lamp here!). 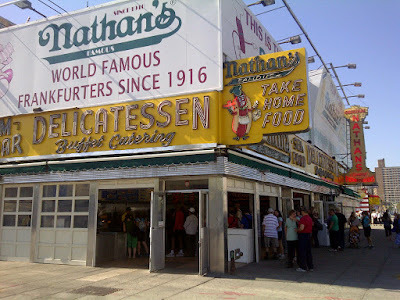 If you find yourself out in Coney Island one day, definitely give this Nathan’s a go!